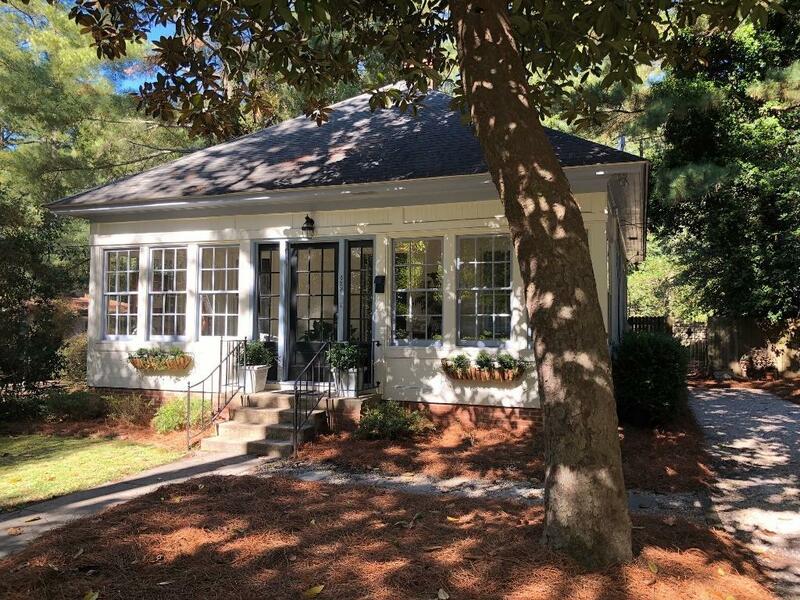 ''San Souci'' is a wonderful opportunity to live in downtown Southern Pines in a story book cottage glowing with warmth and charm. Built in 1930, the cottage has been lovingly updated to perfection while maintaining the original features: heart pine hardwood floors, original glass in double hung windows, antique wrought iron air vents, true stucco exterior, brick hearth on wood burning fireplace and stunning glass front kitchen cabinetry with plate shelf in kitchen. Nine ft. ceilings throughout. Interior stairway to full attic and basement affording generous storage and expansion space. Granite counter tops, stainless appliances and hardwood floors in kitchen. Over-sized shower and updated vanity in bath. Dream deck overlooks private back yard with 7-9 ft. fences. Natural gas. Exterior Features: Deck, Fencing, Natural Gas Avail.